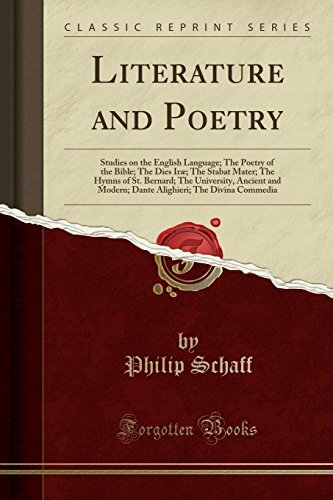 Literature and Poetry: Studies on the English Language; The Poetry of the Bible; The Dies Iræ; The Stabat Mater; The Hymns of St. Bernard; The ... The Divina Commedia (Classic Reprint) by Forgotten Books at Translate This Website. Hurry! Limited time offer. Offer valid only while supplies last. Excerpt from Literature and Poetry: Studies on the English Language; The Poetry of the Bible; The Dies Iræ; The Stabat Mater; The Hymns of St. The Greek abounds in wealth, Vitality, elasticity, and beauty; and hence it became the organ not only of every branch of ancient classical science and art, but also of the eternal truths of Christianity.